How did Easts take the Minor Premiership from Souths? They spanked them... undermanned too. Nic McInerney and Warrick Nicolson recap the Roosters' 24-12 win over the Rabbitohs in Round 26 - just 10 minutes after fulltime. All the big moments are dissected and we wonder aloud - did one of these teams just show they haven't got the poise to win the Grand Final? Good to have us back? 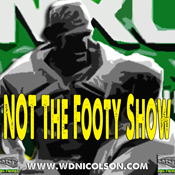 LIKE the show on Facebook to discuss the upcoming month of NOT The Footy Show or catch us on Twitter: @NRLTweet or our individual accounts @wdnicolson @Mr_DC11 @mtsialis @mrpeninsula and Nic McInerney is going to use Facebook to communicate.